Boers-Li Gallery is delighted to announce Ye Linghan’s solo exhibition, Lucy Episode II: Dance, Tattoo, Data Carnival, opening on May 26, 2018. This show is comprised of recent paintings from the artist’s ongoing series, “Lucy” and a video work, “Dance, Tattoo, Data Carnival”. The ubiquitous presence of the Internet in every aspect of our lives is a condition that became particularly apparent and irrevocable to Ye Linghan in 2016. To address the advent of what the artist claims as the future (or Year One of Artificial Intelligence), he began to translate this reality into his artistic practice under the fictional protagonist “Lucy”. In presenting its second episode, “Dance, Tattoo, Data Carnival” Ye Linghan continues to investigate the impacts of virtual reality on human behavior, while projecting a prescient outlook of the future through his artistic practice. Confronted by the manipulative nature of digital algorithms, Ye questions whether we are still in control of our own self-conscience. “Are the artist’s imagination and original creativity still the most esteemed qualities of artistic practice?” becomes the artist’s probe. To which, Ye Linghan’s digitally simulated video, “Dance, Tattoo, Data Carnival” explores the mirror image of our identities in the virtual world while paying tribute to a classic oeuvre, Henri Matisse’s painting “Dance” (1909-1910). These five dancing figures are coated images captured online in a constant flux, a configuration that seems especially abstract with their ongoing movements. With this visualization, the artist projects the current conception and perception of our identities, in the real and virtual worlds. The paintings on view are from Ye Linghan’s ongoing series, “Lucy” (2016-), that have adopt a method of the artist’s own invention. Inspired by Matisse’s “cut-outs” collage paintings and the stencil-plating technique in graffiti art, Ye hopes to generate the logics stacking/layering of interfaces on digital platforms, by integrating these visual means in building vertical structures on canvas. Without the necessity to come up with “original content”, Ye selects images from the countless pushes he receives, and flattens their inherent information with single colors or color gradations. Often appearing with sharp-edges, fluorescent paint, and seemingly non-human artistic executions, Ye Linghan’s paintings tally the flux of information that engulf our everyday online experiences which in turn, redefines what constitute being human of the future. Ye Linghan was born in 1985 in Lishui, Zhejiang Province, who graduated from the China Academy of Art in 2009, and currently lives and works in Beijing. 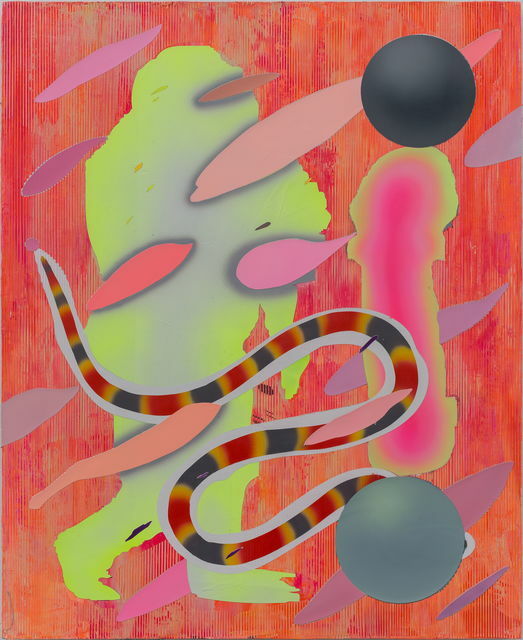 His recent solo exhibitions include, “Lucy Episode I: LucyLucy” at Vanguard Gallery, Shanghai, “The Way Things Were” at Vanguard Gallery, Shanghai and “Gold Circle Tiger” at Ben Brown Gallery, Hong Kong. His works have been included in major group exhibitions, “Bi-City Biennale of Urbanism/Architecture”, Shenzhen, China; “Fantasy Creator”, chi K11 Art Museum, Shanghai, China; “Expiration Date of A Home”, JNBY, Beijing, China; “Pixel Park”, Jiangan Sculpture Park, Shanghai, China; “Animamix Biennale 2015-2016—Space In Mind”, MOCA, Shanghai, China; “We-A Community of Chinese Contemporary Artists”, K11, Shanghai, China; “Degeneration”, OCT Contemporary Art Terminal, Shanghai; “Moving image in China:1988-2011”, Mingsheng Art Museum, Shanghai, China, among others.